A Hard Day's Night will be screening at the 2014 Emirates British Film Festival as one of the Six from the 60's films. For more information on times, dates and tickets, please visit the official website. 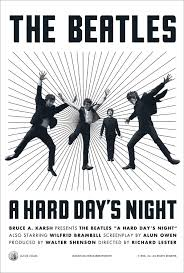 To purchase A Hard Day's Night , please see link at end of review. A Hard Day's Night is undoubtedly one of the best music films of all time. Whether a fan of The Beatles or not, it is impossible not to appreciate the snapshot of history which the film captures. While A Hard Day's Night features some of the band's greatest hits and is tremendous fun, it is treasured for the rare glimpse it gives into a day in the life of the Fab Four that explores the personalities of the band members with hilarious results. In 1964, The Beatles were the biggest band of the world. Their days consisted of travelling from one town to another to perform live shows and always with a crowd of screaming and crying teenage girls in tow. However, John Lennon, Paul McCartney, George Harrison and Ringo Starr were just four young lads from Liverpool out to do what they love, but at the same time have a bit of fun. On this particular day, they are accompanied by Paul's grandfather (Wilfrid Brambell) who turns out to be the biggest troublemaker of the group and encourages Ringo to take a stand against his fellow band members as a result of their constant teasing. The drummer abandons his band with only hours to go till their highly anticipated live television performance, which throws everything into turmoil. A Hard Day's Night is something very special. What makes it so entertaining and enjoyable is that the film truly feels as though a group of boys just got together and decided to make a film of themselves being completely random and hilarious. In this case, the boys just happen to be The Beatles. The naturalness of these famous boys being boys is a complete credit to screenwriter, Alun Owen. Owen followed The Beatles around for a time before they left for America (which they discuss briefly in the film) and came to understand the personalities of each of the band members, which allowed him to accurately craft the screenplay around a day in the life of the foursome. It was no coincidence that it was Ringo abandoning the band as he was tagged as the sad one who was always at the back as he was the drummer, so therefore automatically the odd one out. Each band member's personality shines through in the film and it is such a wonderfully personal thing to have this film which shows the four just being boys and doing what boys do, with the added extras of fame and music. While the majority of the film was scripted, the four all improvised at certain times throughout and the results are hilarious. The random brand of humour employed in the film paves way for numerous hilarious and now famous quotes which are witty and delivered with perfect timing. Director Richard Lester reiterated the fact that he was not trying to get any award winning performances out of the band, but wanted each of them to perform as naturally as possible which is clearly evident in the film. John, Paul, George and Ringo all look completely at ease on screen and with each other during the film and it is refreshing to see that none of them are trying to be something they are not. The soundtrack of the film is, of course, perfection for any Beatles fan as it contains many of the band's greatest hits including "Can't Buy Me Love", ""And I Love Her" and "A Hard Day's Night". "Can't Buy Me Love" is a particularly well crafted piece in the film as it acts as the song for the band's escape from the craziness that ensues them. The four take off in a large field where they are able to run free and do whatever they please. There are some fantastic aerial shots during this song and the editing superb, as it is throughout the whole film. Visually the film is also a historical snapshot of the early 1960's where all the women had high, teased hair and go-go danced at parties. 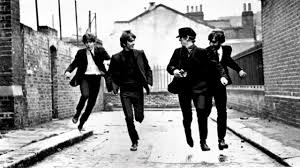 A Hard Day's Night is incredibly enjoyable and toe-tapping fun with it's timeless soundtrack. It is the film that delights anybody who admires The Beatles and has the ability to convert others into fans.